How did a Salt Lake City elementary school teacher become an enormously popular food blogger? Kalyn Denny took to the blogosphere to write about the excellent recipes that allowed her to lose more than 40 pounds. Her blog, Kalyn’s Kitchen, attracts thousands of readers. “My blog has become popular with people who want to try the lower glycemic way of eating, but most people who visit here just come to find great tasting food!” Dennis writes on her web site. Her fresh salad featured here capitalizes on produce very much in season this time of year: zucchini, tomatoes, and basil. Dennis created the dish for another terrific food blogger we’ve featured here: Karina Allrich, who produces amazing gluten-free dishes. Allrich, who suffers from a digestive condition known as celiac disease, had come down with a new set of food allergies. Hence this recipe, which requires no cooking. Slices of fresh zucchini are artfully topped with slices of fresh tomato. 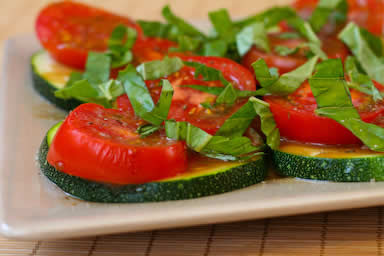 The zucchini and tomatoes are dressed with extra virgin olive oil and balsamic vinegar. The dish gets a sprinkling of thinly sliced basil.